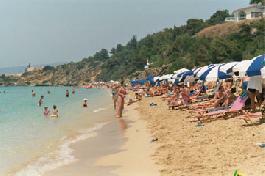 Makris and Platis Gialos are two consecutive beaches, of the most famous in Kefalonia. They are very close to Argostoli and the peninsula of Lassi. They are highly organized and provide the opportunity for water sports. They are considered family, but you will meet many young people showing their preference. Close to these beaches you will find many hotels, rooms to let, taverns and coffee houses.